“The absence of a principled conservative voice with limited-government, constitutional conservative ideas in the inner counsels of the House Republican leadership has resulted in a tone-deaf GOP leadership team that spends too much time attacking its conservatives and not enough fighting Obama and the Democrats,” said Viguerie. “Today’s vote shows that Republicans have Electoral Learning Disability. In the modern era Republicans have won four landslide elections: 1980, 1984, the Contract with America congressional elections in 1994 and the Tea Party wave election congressional elections in 2010. And the GOP won by running against Washington’s tax and spend status quo and Big Government. In each of these elections insurgents – conservative outsiders – were the face of the Republican Party,” noted Viguerie. “As I documented in my new book TAKEOVER, when Big Government establishment Republicans are the face of the Party, Republicans lose, most recently in 2006, 2008, and 2012,” said Mr. Viguerie. Richard A. Viguerie, called the “Funding Father of the conservative movement,” pioneered political direct mail and has been called “one of the creators of the modern conservative movement” (The Nation) and one of the “conservatives of the century” (Washington Times). His newest book is, Takeover: The 100-Year War for the Soul of the GOP and How Conservatives Can Finally Win It. Submitted by Gerry on Mon, 06/23/2014 - 14:06. The only thing that indicates "Honorable" about congress is the nameplate in front of them! Their actions belie their pathetic promises! Submitted by david.is.farrar on Fri, 06/20/2014 - 21:55. “The gap between the leadership of the Republican Party and the base of the party continues to widen." As a constituent of Rep Tom Graves(R, GA), I, too, was frankly shocked Rep. Kevin McCarthy would have asked him to place his name in nomination for the House leadership position. I was even more surprised to see Rep Graves accept the invitation. So who is fooling who? It probably won't take us long to find out. But if the House stalls amnesty, or legalization, until after the 2014 elections, I would considered Tom's gamble will worth the risk. Submitted by CrustyOldGeezer on Fri, 06/20/2014 - 13:08. Boehnor and crew are ENABLERS for the democrat ANTI-AMERICAN agenda. And they do so with the complete lack of concern for the People that put them into office. Under the current method of 'business' in DC, boehnor, a pathetic loser from an apparently pathetic loser district in Ohio has entirely too much power over every other Congressional District in America. ALL districts, which encompasses ALL VOTERS should have equal access to the Power of the federal government instead ALL POWER being controlled by pathetic people like boehnor, and reid in the Senate. Neither are 'gentlemen', and neither are Statesmen. Neither care about the health of the Nation. It is raw power or nothing, and the "nothing" is the only thing that is allowed the People. Submitted by David Givens on Fri, 06/20/2014 - 12:54. 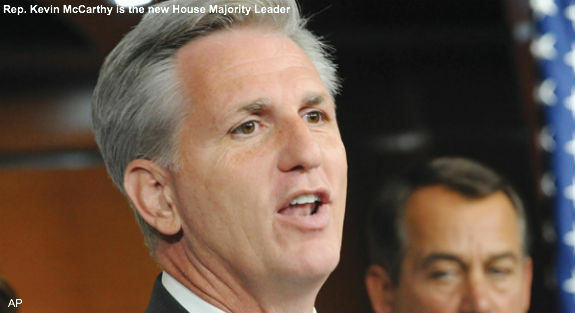 Let’s fire Rep. Kevin McCarthy and Rep. Steve Scalise! They, like all Representatives, are up for reelection in November. If Tea Partiers and other conservatives vote for the Democrat both of these RINOs will be thrown out. Don’t worry, we will retain our majority in the House. And we will teach the Republican establishment a lesson!